In Richmond, Virginia, memories of a racist past are everywhere — from Confederate monuments to slavery memorials. Now, painful images of racism are in the headlines, too, as the fallout over a blackface photo in the governor's yearbook continues. To see the deep pain blackface inflicts on the people it was designed to denigrate, one must only examine the sober expressions of those gathered in a Richmond, Va., chapel to hear a fiery sermon from civil rights activist Rev. Al Sharpton. 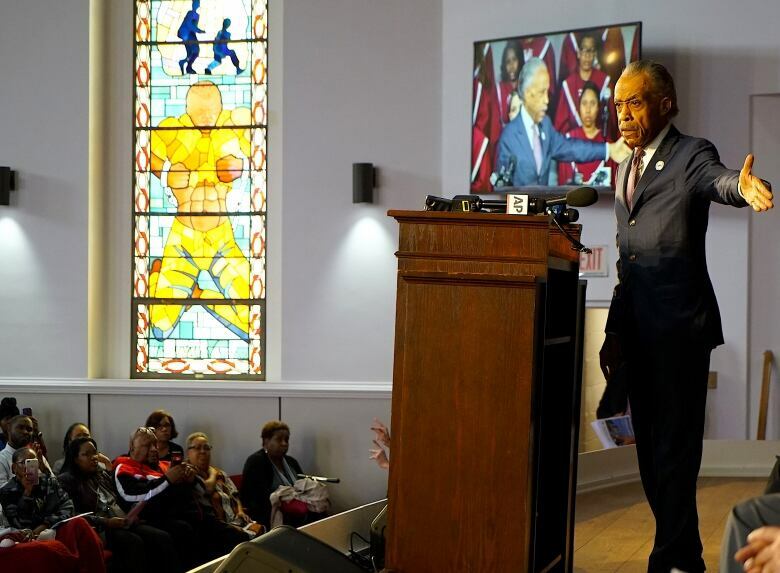 "Blackface represents a deeper problem, where people felt they could dehumanize and humiliate people," Sharpton told the congregation. "We cannot sit here at this moment in American history and make it normal that folks blackfaced." The crowd of hundreds applauded in agreement. Some rose to their feet, waving their hands in the direction of the reverend. "If you sin, you must pay for the sin," he declared. "If you can mock us, then you can legislate and govern against us and nobody will care." Sharpton's words were a rebuke of Virginia Gov. Ralph Northam. Last week, a photo from Northam's 1984 medical school yearbook page surfaced, showing two men — one in blackface, the other wearing a Ku Klux Klan robe. Northam, a Democrat, initially apologized for appearing in the racist image, only to backtrack the next day and say neither man in the photo was him. However, he did admit to wearing blackface while dressed as Michael Jackson in a dance competition in the '80s. Days later, the state's third-ranking elected official, Attorney General Mark Herring, also became embroiled in the scandal after admitting he wore blackface at a party as an undergraduate student. The episode has triggered an embarrassing crisis in Virginia politics, and has also ripped open the wounds of a racist past never too far from the present in this city. Richmond, now the state capital, was once the capital of something else: the Confederate States of America. 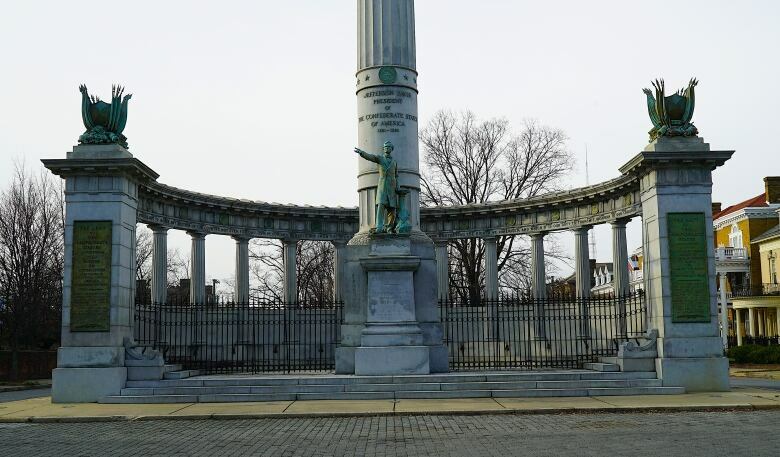 The legacy of the Confederacy is woven through the city's landscape, nowhere more so than on a scenic boulevard known as Monument Avenue. At nearly every intersection there are grand monuments paying homage to Confederate leaders such as Gen. Robert E. Lee and Jefferson Davis, the president of the seceded states before the Civil War. On the other side of town is the Reconciliation Statue, not far from the White House of the Confederacy, where Davis lived. The statue is on a corner where people brought to the U.S. in chains were displayed for wealthy slave owners to evaluate and buy. 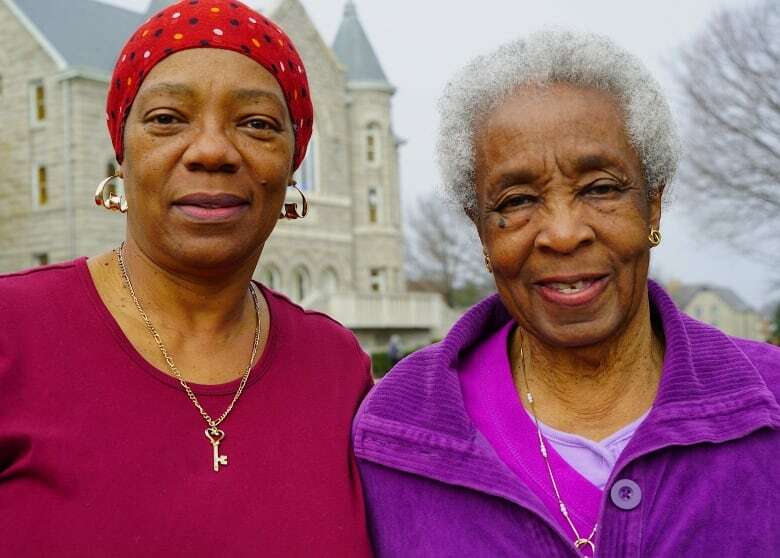 The first enslaved Africans arrived in Virginia 400 years ago, in 1619, and the port of Richmond was one of the busiest in this trade of human cargo. 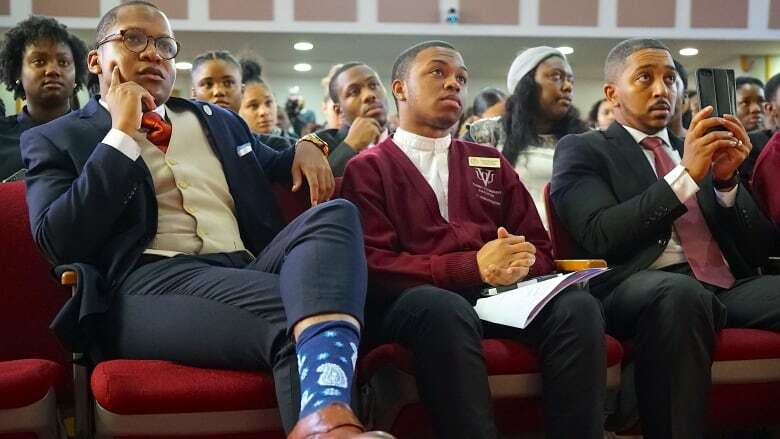 "We were always well aware of what white supremacy looked like," said Jamar Boyd, a youth leader of the National Association for the Advancement of Colored People (NAACP) in Georgia, who delivered a sermon of his own at Sharpton's service. "It's not shocking because it's American. It's true to the history of this nation." Boyd compares the blackface photo on Northam's yearbook page to these other stark reminders of Virginia's history, describing them as "painful and consistent" symbols of subjugation for the African-American community. He says the governor should resign. "For me, as a black man, the excuses are never enough," Boyd said. "There's a level of seriousness to what he's done. Just because you're a Democrat and got the majority of the black vote doesn't mean you hold the black consciousness close to your heart." Northam received 87 per cent of the black vote in the 2017 governor's race, riding a wave of anti-Donald Trump sentiment fuelled partly by the president's ambivalent response to the racist violence in Charlottesville, Va., earlier that year. Northam ran on a progressive platform that appealed to black Virginians, who are much more likely to face poverty than their white counterparts. The poverty rate for black people in the state hovers around 18 per cent. For whites, it's about eight per cent. Poverty has ripple effects. Richmond's schools are partially segregated based on economics: black children are more likely to live in poorer neighbourhoods; poorer neighbourhoods are home to poorer schools, leading to fewer opportunities for black children. Northam promised to address some of these problems. 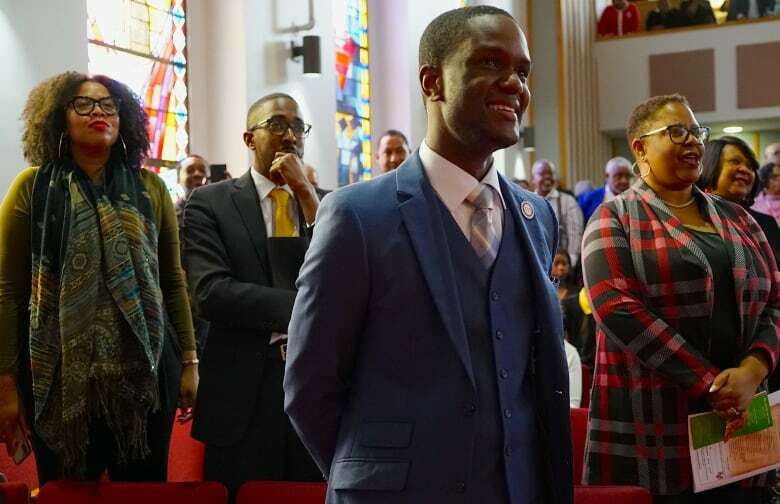 He vowed to fight for free community college, a higher minimum wage, criminal justice reform, and to remove laws requiring photo identification to vote, which are often criticized as an attempt to suppress black votes. His campaign — and his record in office thus far — earned him sympathy among some members of the black community when the yearbook photo emerged. 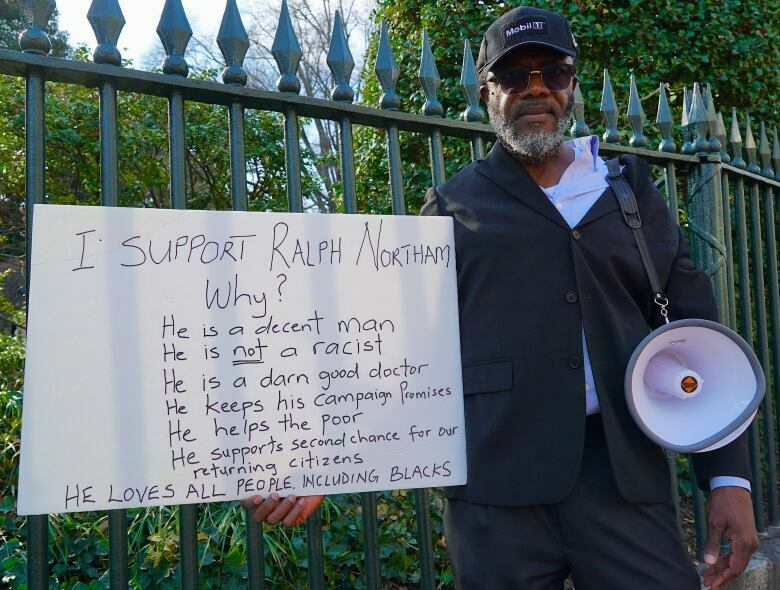 Oludare Ogunde, an immigrant from Nigeria who has lived in Richmond for the past five years, bought a bullhorn to chant messages of support for Northam from outside the gates of the governor's mansion. "I'm not saying what the governor did is fine," he said. "But the bottom line is this: Do you judge somebody today based on what they did years ago?" Elsie Williams, an 89-year-old Richmond resident, had a similar reaction — at first. "I felt a lot of compassion toward him when he said he was in the photo and apologized," she said. "But then when he said he wasn't in the photo, that's when I got hurt feelings ... I felt betrayed and I felt let down." Williams, a matriarch of four generations who, for many years of her life, was not allowed to drink from the same water fountain as a white person, says the insult of blackface is particularly damaging for black men. "Blackface ridicules them," she said. Blackface dates back to the minstrel shows of the 1800s, where white performers would darken their faces and exaggerate the size of their lips as they performed in torn clothing, mocking enslaved black people by portraying them as lazy and ignorant. The performances were popular across the United States — in the North, where they originated, and in the South. White audiences laughed as black people were demeaned. "I've come to Richmond to tell the governor, 'I'm not going to be your minstrel!'" Even though Northam now denies being in the blackface and Klan photo, the fact the photo was on his yearbook page at all in 1984 shows racism's lasting legacy. For Tim Lee, the pain spawned by such imagery will never fade. And he's fed up. 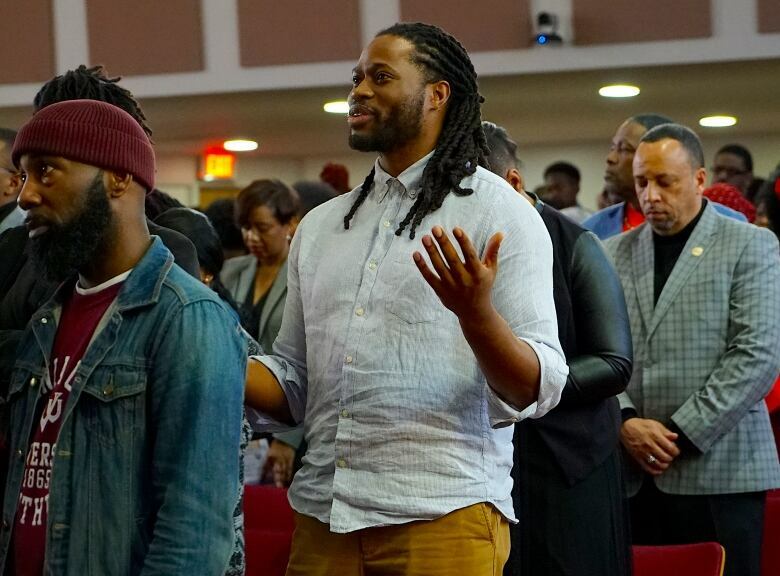 "Everyone else is on the hill and black people are down in the valley, even though we all have the same laws," said Lee, a 37-year-old Baptist minister. Lee is so frustrated with the place of black Americans in society, including the economic segregation they face, he says he advocates separation between black and white Americans. He says the black community should find more ways to support itself instead of relying on the government. "We are too dependent on our former enemy, our historic enslaver," he said. "If he [Northam] doesn't resign, what are we going to do? When are we going to stand up?" The symbols of the past are everywhere in Richmond, but a universal salve to ease the hurt they stir up doesn't exist. Nor is there a consensus on what Northam should do next among the constituents who feel aggrieved by his actions. But the governor, at least for now, is staying put. MarQuita Carmichael, assistant director for religious life at Virginia Union University, says it may be the best course of action, even though she says she "hates" what the photo represents and, upon first sight, thought the governor needed to resign. "You can't discount our history," she said. "But racial reconciliation is not about the resignation of politicians; it is a deeper work." Carmichael says Northam should still have a chance to deliver the better tomorrow he promised. 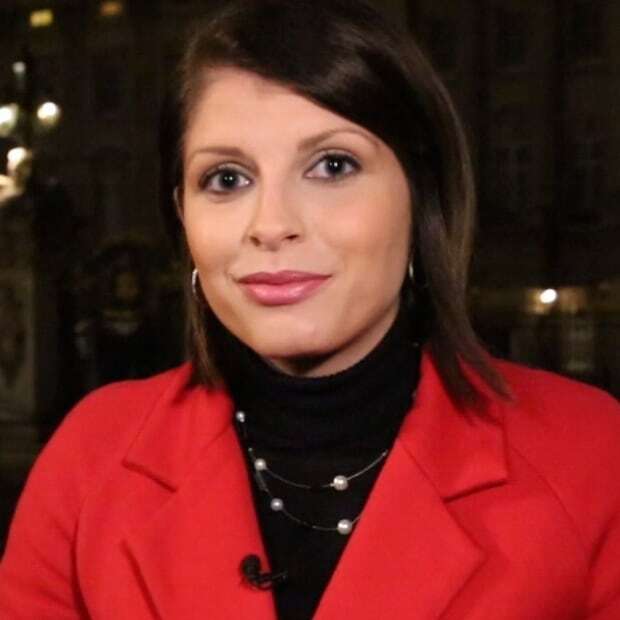 "For me, the agenda that I voted for is being followed."